Here it is. The sight to see. The Acropolis of Athens. As you can see by looking at the top right picture it was a dark and stormy...day. Just know that marble is, in fact, slippery when wet. Tennis shoes or sport sandals are the way to go. We spent the morning of April 9 visiting this famous site and dodging the large tour groups wearing stickers and following someone holding a sign with a number on it. The most famous site on this "city on the edge" (what an acropolis is by definition) is the Parthenon. One of my favorite stories was one of the other temples that was decorated with pillars that were carved women of Sparta. Apparently, they were the "Real Housewives of Suburban Sparta" because the warrior women of Sparta weren't nearly as good looking. 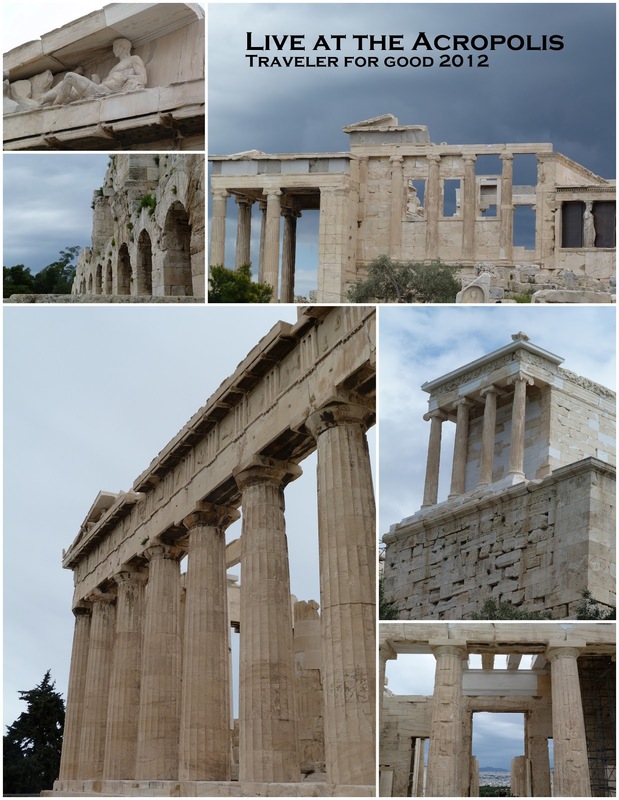 The Parthenon was used for a variety of purposes throughout history. In the 1700s it was used to store gunpowder and the roof blew off. Different governments, conquerors and people who love art stole many of the sculptures over the centuries. Some of the art was even destroyed because it portrayed the "heathen" gods and goddesses of ancient times. The ticket you get for the Acropolis can also be used to get into the Museum of the Acropolis where you can see depictions of all the scenes that were on all sides of the Parthenon. Some are the actual stone is there and some is recreated. The Museum is on the Plaka, the pedestrian area of Athens where there are a lot of cafes and shops. We dodged the rain in the afternoon with cups of cappuccino and a giant slice of baklava.